76 Union Street is where the Chipman Hill Suites office is located, and it also houses five lovely open concept executive units on its second (top) floor. Each unit has a full en-suite bathroom with an airpool tub. Two of the five have a full kitchen and a queen bed, another two have a full kitchen and a king bed, and the remaining unit has a kitchenette and a king bed. There is one washer/dryer set at 76 Union, on the same level as the guest suites, which is free for guest use. This location is used primarily for more traditional hotel-type stays, but we also host longer term guests here. 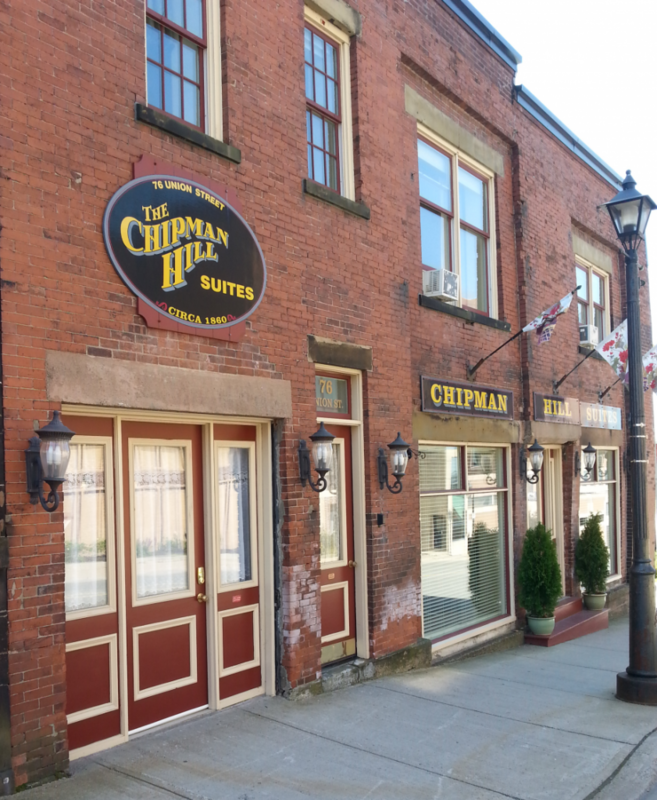 76 Union Street is actually attached to the 1 Chipman Hill property. In fact, between them, they share our only two adjoining suites… one whose address is 1 Chipman Hill and the other whose address is 76 Union Street! 76 Union Street address was once the stable for 1 Chipman Hill, and only recently have we covered up the antique horse heater which is still in the original main floor ceiling, above the new ceiling. The Chipman Hill/Union Street properties are just a parking lot away from the Canada Games Aquatic Centre, where you can gain easy access to the indoor pedway system that links much of the Uptown, including the Saint John City Market, the shops of Brunswick Square and Market Square, the Saint John Free Public Library, the New Brunswick Museum, and even Harbour Station! Neighbours include the Saint John City Police, the Saint John Law Courts, the Saint John Arts Centre, and Vito’s Restaurant. The buildings are just one block down Union Street from Loyalist House. For information on parking at 76 Union Street, please contact our friendly Innkeepers. For a map showing the location of each of our nine properties, please click here. 76 Union Street has a Walk Score of 97. As with all Chipman Hill Suites properties, this building is 100% smoke free. Smoking of any substance, controlled or otherwise, is prohibited within in its walls, or outside within 9 metres of any entrance.